Chatham Head Women’s Volleyball Coach Dylan Lasher has always been a cat. In elementary school, he was a Tiger. In high school, a Bobcat. At Thiel College, he was a Tomcat. 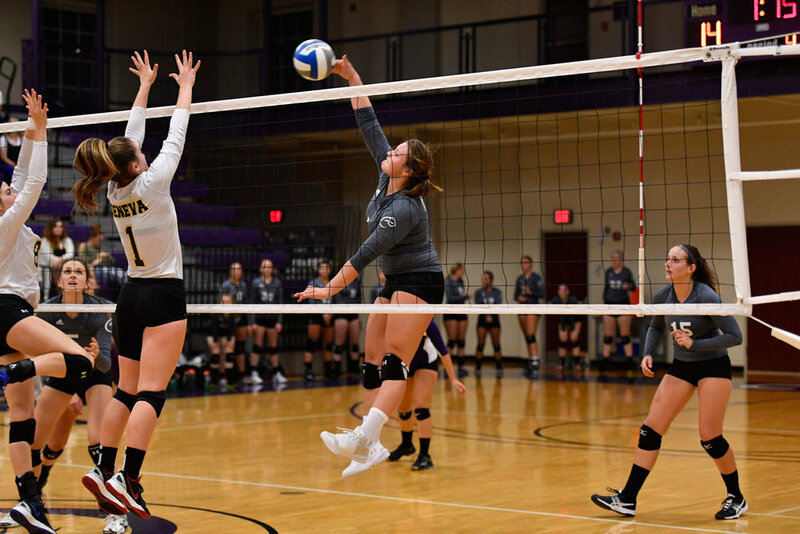 He played for their volleyball team, but it was as assistant student coach for Thiel’s women’s team that he saw the Chatham Cougars in action. He got his chance. Dylan saw an advertisement for an assistant coach position at Chatham, and sent in his application. When he didn’t hear back in a few days, he came down to the Athletic and Fitness Center to hand in his resume in person. If it was his initiative that got him the job, his sterling volleyball pedigree (he’s been playing competitively since 9thgrade and comes from a family of competitive players) and coaching experience (five years plus an academic minor in coaching at Thiel) didn’t hurt. In 2015, the year Dylan came on as assistant coach, Chatham’s women’s volleyball team won one game and lost 30. In February 2016, he was promoted to head coach, and was determined to improve the team’s record. One strategy, of course, is recruitment. And there is one player whose game he knows very, very well. Justyne tamed her serve while retaining her power: in high school, she was a two-time first-team All-WPIAL outside hitter. She drew the attention of college recruiters, including her older brother. Justyne was drawn to Chatham for a number of reasons, including the chance to play volleyball, but felt some trepidation. Today, Justyne is a second-year student at Chatham. She lives in Fickes Residence Hall and is pursuing a criminology major while also taking classes toward an associate in science degree in aviation technology at Community College of Allegheny College. Her dream is to become an airline pilot. She hopes to work for Delta, and eventually for FedEx or UPS, flying international routes. In addition to playing volleyball, she runs track in the spring, and is the DJ for the women’s ice hockey team. With Justyne on board, the Cougars’ game picked up in 2016. Their record was 8 and 23, and they beat Thiel and St. Vincent for the first time in Chatham’s history. But it was in 2017 that things got crazy. “We were struggling a little bit at the beginning of the season”, says Dylan. “We had a good opening tournament but dropped our first four conference matches. 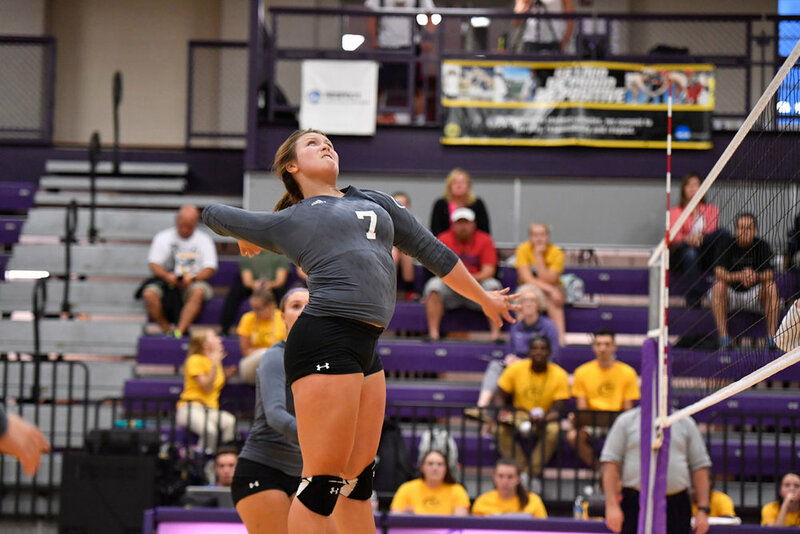 But our Geneva match—beating them 3-2 on their home court—turned everything around.” Sophomore outside hitter Justyne Lasher exploded for a match-high 22 kills and provided 19 digs, three total blocks and two aces, is what the Chatham Athletics website had to say about that game. Justyne was named Cougar of the Week. “The team connected; they were feeling good; they were finally looking like a team that wasn’t a young team anymore,” says Dylan. “They were looking powerful, quick, smart, and it hit there and just continued from there.” After Geneva, the Cougars went on to win their next six games. On October 21, they beat Grove City, clinching their spot in the playoffs. Justyne lead the attack with 16 kills. The Cougars lost that game, and their season was over. They ended it 17-11. They had beaten Geneva, Bethany, and Grove City for the first time in Chatham history. Dylan won PAC Coach of the Year. And coach and one of his star players being brother and sister? They’d both tell you, in the common parlance, that it’s not a thing. Visit gochathamcougars.com for all the latest on Chatham athletics.